The Wildebeests Migration Season in Tanzania comes every year from late or mid December running through March. This is basically the period when the Wildebeests herds in their hundreds of thousands groups converge at Ndutu Plains making up about the whole million plus Wildebeests herd spreading from the Ndutu Plains to the Southern Serengeti Plains. Why Ndutu Plains for Tanzania Safari Calving Season? The Ndutu Plains is a vast savannah plain located within the Ngorongoro Conservations which make up vast grazing plains for the wildebeests migration herds so they come here every year during that period; December to March for their breeding and calving season. The lush green pastures that grow in this area are rich of essential mineral salts that the wildebeests need during this time of breeding and calving and nature being what it is the herds somehow come here during that time that coincides with their breeding season. The area has rich black cotton soils very fertile but the soil is rich with mineral and the the lakes Ndutu and Lake Masek in this area provides for the much needed water that collects in these lakes during the short rain season of October – November every year. 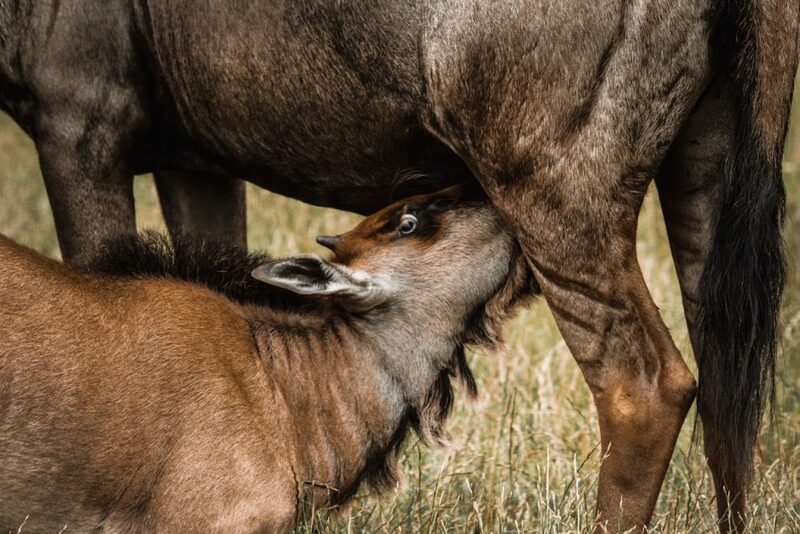 Can I see the wildebeests giving birth, and when should I come to see the calving Season? Ndutu Plains are a great safari season so if you are planning for a Tanzania Safari Tour, you can always request our travel experts to include Ndutu for you in your itinerary. The plains form great herding grounds for big cats especially the lions and cheetahs thus many researches by zoologists have been done and are still being done in these plains to date. The biologists sometimes camp in this area for months to study the lions so don’t be surprised to spot some ‘tagged’ lionesses with neck bands that are fitted with satellite sensors so as they can be monitored as the biologists conduct more studies about the big cats. If you however are after a calving season you should time your travel time for end December and if you wish to see the wildebeests giving birth then you should try and time your travel time for February. Of course there is never a guarantee of what you can see while on safari and that is why we call animal tracking on safari with our Tanzania Safari customized vehicles; ‘Game drives’. We offer these Calving safari tours in Tanzania in combination with beach time so we can always customize our Tanzania Safari and Zanzibar Beach packages with 2 or 3 nights or more at Ndutu Plains if your safari coincides with the calving season. Such safari packages in Tanzania that we offer in combination with lazy beach days or active tours in the legendary Spice Archipelago of Zanzibar includes our Safari to Serengeti and Zanzibar which is a special offer package covering the famous Serengeti plains of Tanzania and beach time at Zanzibar. Others are our Honeymoon Safari in Tanzania & Zanzibar that takes 12 days visiting the highlights of Northern Tanzania then wind up with the beach or our famous 10 days East African Highlights package including Kenya, Tanzania Safari & Zanzibar Beach. As the Wildebeests Calving season safari season comes to a close we are offering special offer safaris, short and long lodge safaris in Tanzania at very competitive prices starting this April & May because it will be our Green Season. Can I travel to Tanzania for safari in April or May? The Green Season in Tanzania starts from April running through May and during these months which are considered long rain seasons we offer special priced lodging safaris where by you can choose to stay in the midrange lodges & tented camps or the standard lodges which give us very competitive rates that we are happy to extend to our esteemed safari lovers. Whether you can travel in April or May to Tanzania for safari or not is a matter of personal choice and what you want for a safari tour in Tanzania. Tanzania safari in April or May offers the chance to do game viewing in vast plains in the national parks with the most minimal crowds and you feel like you have all the park all for your own. If you are planning for your nest safari to Tanzania let us know if you will like to travel next year during the wildebeests Migration season or take an advantage of our great prices for the April & May season this year. We are now taking last minute bookings for Tanzania Safari!